The police officer whose heavy handed, 'out of control' actions breaking up a North Texas pool party were caught on camera and caused national outrage has resigned.. Officer David Eric Casebolt left his job with the McKinney Police Department on Tuesday after almost 10 years on the force and the day after a local protest drew nearly 1,000 people to the streets. His resignation was confirmed by his attorney, Jane Bishkin of Dallas and comes after calls for him to leave his job echoed across the Dallas-area city of McKinney and beyond via social media. McKinney Police Chief Greg Conley made the comments during a news conference Tuesday after Officer David Eric Casebolt resigned. Twelve officers responded to the report of fights and a disturbance at the pool party at the Craig Ranch North Community Pool in an affluent area of western McKinney. 'Eleven of them performed according to their training,' Conley said. Casebolt did not, he said. 'He came into the call out of control and the video showed he was out of control during the incident,' Conley said. 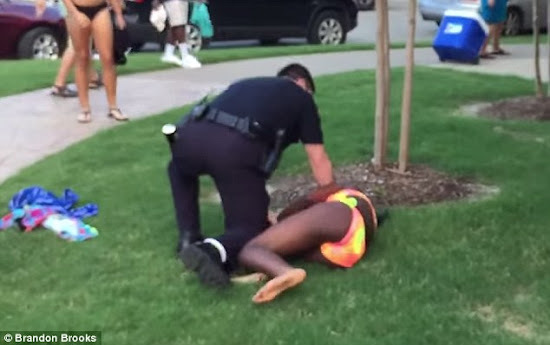 A viral video showed him pushing a bikini-clad girl to the ground on Friday and brandishing his gun at other black teens after he and other officers responded to complaints about the pool party at a community-owned McKinney swimming pool. Chief Greg Conley had placed the 41-year-old former Texas state trooper on administrative leave after the incident. Casebolt's actions are under investigation and no decision has been made whether charges will be filed against him, Conley said. Charges of interfering with an officer and evading arrest against the only man arrested during Friday's incident have been dropped, Conley said. Everyone else detained was released. Bishkin declined to say where Casebolt is now and said he had received death threats. The attorney said she would release more information at a news conference Wednesday. Meanwhile, a police union on Tuesday afternoon defended how officers handled the pool party disturbance. The incident, about 30 miles north of Dallas, is the latest to draw attention to the issue of police use of force in the United States, especially against minorities. 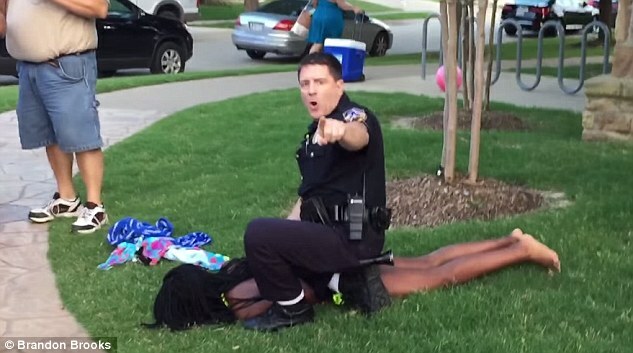 The McKinney Fraternal Order of Police (FOP) said the conduct of police in the incident had nothing to do with race. 'The McKinney FOP assures that this was not a racially motivated incident and can say without a shadow of doubt that all members of the McKinney FOP and McKinney PD (police department) do not conduct racially biased policing,' the union said in a statement on Monday. Hundreds of people rallied in McKinney on Monday night demanding the firing of Eric Casebolt, the officer seen in the video. Casebolt has been placed on administrative leave by the department and has not spoken publicly about the incident. The video shows him shouting obscenities at black youths in a multiracial crowd, briefly pointing his gun at them, throwing the 15-year-old girl to the ground and burying his knees in her back. 'With that said, the use of profanity during high stress incidents may occur when attempting to gain control of unruly subjects who are not complying with officer's commands,' it said. The role of race in the incident has divided the quickly growing city of about 150,000, which has attracted young families seeking affordable and spacious housing, good schools and a violent crime rate about 85 percent lower than that of Dallas. In 2014, McKinney was ranked number one as Money magazine's annual ranking of Best Places to Live in America. It had a median household income of $80,000 in 2012. 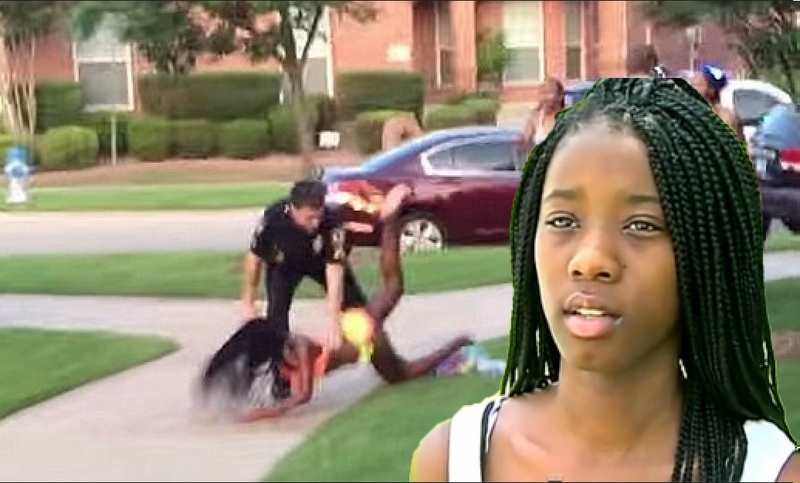 The seven-minute video, viewed 9 million times on YouTube as of Tuesday morning, shows officers responding to the incident, which police said started when scores of young people attended a party with a disc jockey at a community pool and refused requests to leave. Dajerria Becton, the 15-year-old girl thrown to the ground by Casebolt, told broadcaster KDFW the officer twisted her arm and grabbed her by the hair. 'Him getting fired isn't enough,' she said. The video, which was posted online shortly after the incident, shows him pushing Dajerria to the ground and pinning her down by leaning on her with both of his knees.